We are very pleased to continue the AGEDI Regional Symposium for its final day. We will be discussing planning given the uncertainty of sea level rise, food security and public health co benefits of reducing green house gas emissions! Otherwise come join us at Al mamoura A auditorium 9am, March 15th! All registrants will receive a link to the recording – so please register even if you cannot attend the live event. 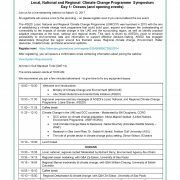 The AGEDI Local, National and Regional Climate Change Programme (LNRCCP) was launched in 2013 with the aim of establishing a climate change work programme that could build upon, expand and deepen the understanding of vulnerability to the impacts of climate change in the UAE and the surrounding region, as well as identify practical adaptive responses at the local, national and regional levels. This work is driven by AGEDI’s vision to enhance accessibility to environmental data and information to support effective decision-making. AGEDI has engaged stakeholders throughout the region around five thematic areas: Regional climate change, Environment, Water resources, Coastal zones, and Socio-economic systems. The online session starts at 9:00 AM We recommend you join a few minutes beforehand – to give time to fix any equipment issues. All time in Gulf Standard Time (GMT+4) The online session starts at 10:00 AM We recommend you join a few minutes beforehand – to give time to fix any equipment issues. 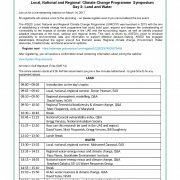 The agenda for the Symposium focuses on the twelve (12) recently completed studies of the Local, National, and Regional Climate Change Programme (LNRCCP). The program will have sessions for the presentation of stakeholder-reviewed studies over the three days of the Symposium, including invited lectures from each of the Principal Investigators (or designees). Climate Change Inspectors Toolkits Now Online! We are very pleased to announce that the Local, National, Regional Climate Change Project Inspectors are now all online! The 12 projects are subdivided into five thematic areas. 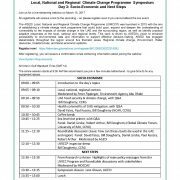 The regional climate change thematic area includes the two studies that formed the backbone of the programme: these are the Regional Atmospheric Modelling and the Arabian Gulf Modelling. Building on that, two studies were carried out under the Environment thematic area: the Terrestrial Biodiversity and the Marine Biodiversity. 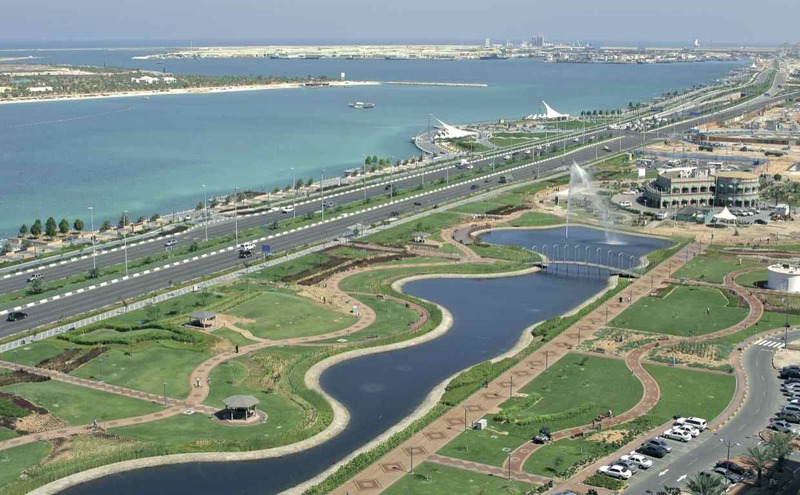 The water resources thematic area includes three studies: the Regional Water-Energy Nexus, the UAE Water Energy Nexus and the Al Ain Water Resources. The Coastal Vulnerability Index and Sea Level Rise studies were conducted under the coastal zones thematic area. Finally, the last thematic area, socio economic systems, included three studies: the Desalination, the Food Security and the Public Health Co-benefits of Greenhouse Gases (GHG) Mitigation. All outputs of the programme are freely available to all stakeholders, and the general public. 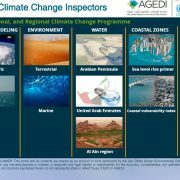 A comprehensive set of data used, models developed, maps/videos produced, as well as technical reports and decision makers briefs prepared can be accessed and downloaded through AGEDI’s innovative and interactive online inspector portal, available at www.ccr-group.org/cc-inspectors. https://agedi.org/wp-content/uploads/2017/03/Capture.jpg 695 1200 AGEDI News Editor https://agedi.org/wp-content/uploads/2014/12/AGEDI-Logo86.png AGEDI News Editor2017-03-06 11:43:462017-03-06 11:45:36Climate Change Inspectors Toolkits Now Online!